Written on 10 April 2009 . 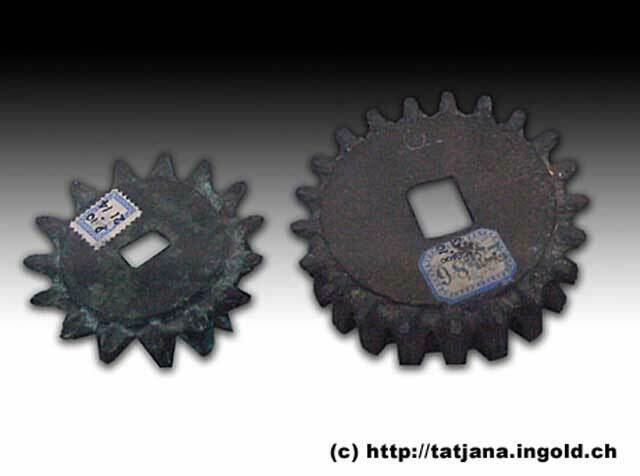 This complex mechanism, found on the wreck of the Antikythera in 1901, has been dated to 150-100 BCE. Although this date is fairly recent in human history, nothing similar has ever been found as one might expect. Could this mechanism be a relic from a much earlier date, preserved through hundreds if not thousands of years, but lost at sea during transportation? It is believed to have been used to calculate astronomical positions and would have required advanced mechanical engineering knowledge and sophisticated manufacturing techniques. The photograph below shows cogwheels displayed in the Cairo museum. When were they manufactured, and which type of metal alloy was used? What were they intended for? The first functional telescopes of the modern era were invented in the Netherlands at the beginning of the 17th century. The knowledge of lenses however dates back much further in history, as attested to by numerous ancient lenses that have been discovered by archeologists, including the so-called Cairo lens shown below. 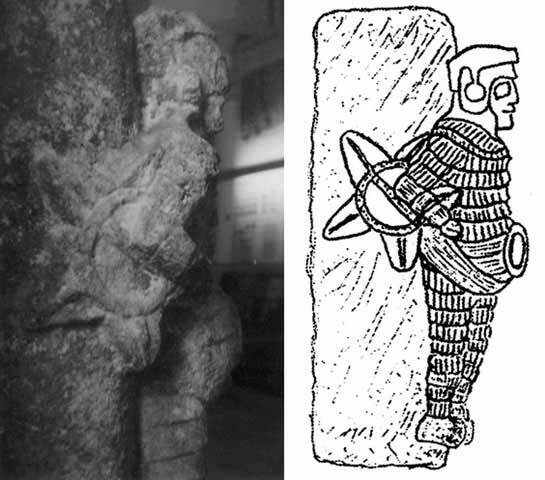 The Peruvian carving depicting a man with a telescope and an approaching comet suggests firstly that the ancient possessed telescopes, and secondly that this telescope enabled them to detect an approaching comet in time to prepare to depart from Terra Australis and the surrounding areas. Figure 49. 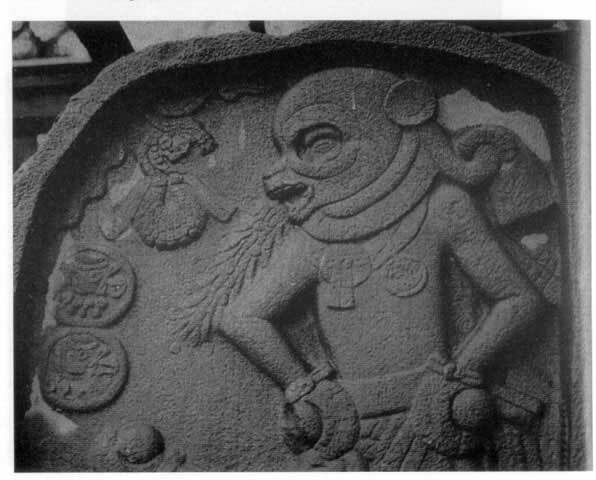 Peruvian stone showing a man studying the heavens with a telescope, with a fiery comet approaching? 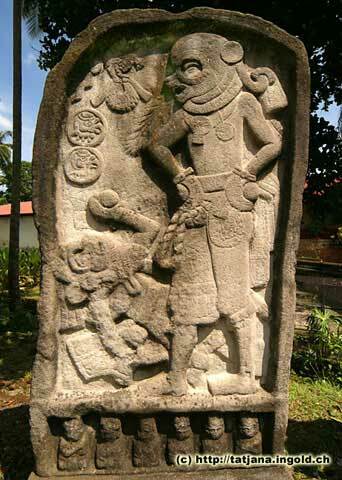 These stones, know as the Ica Stones, were collected by Javier Cabrera but are generally believed to be a hoax. The location of the caves and streams in which they had been found has never been revealed. Amongst the 15 000 stones are images of men fighting dinosaurs. Remarkable indeed, if the stones are authentic. Could any of these stones be real? The curious artifact shown below is usually referred to as the Baghdad Battery. 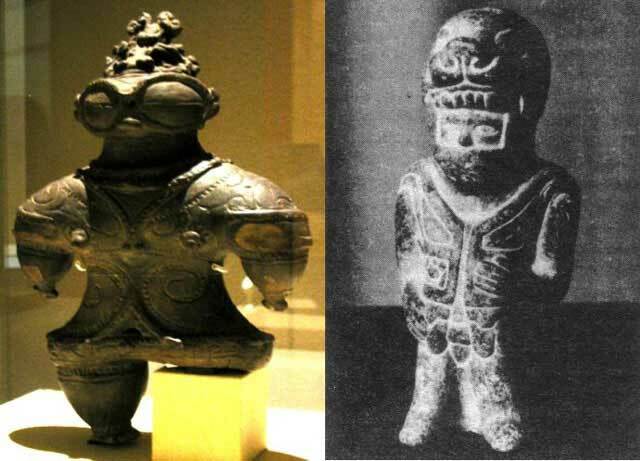 Several such terracotta jars have been found, 150mm in height containing a copper cylinder that houses an iron rod. It has been argued to represent an ancient battery (not universally accepted), dating from the first centuries CE, and has been demonstrated to produce electricity using grape juice as an electrolyte. An interesting possibility. In Section 1.4 of Terra Australis Incognita above I have argued that the origin of the fire-breathing dragon myth can be traced back to the ability of the ancients, known as ‘Serpents’ to other nations, to fly and attack their enemies from the air with fire. 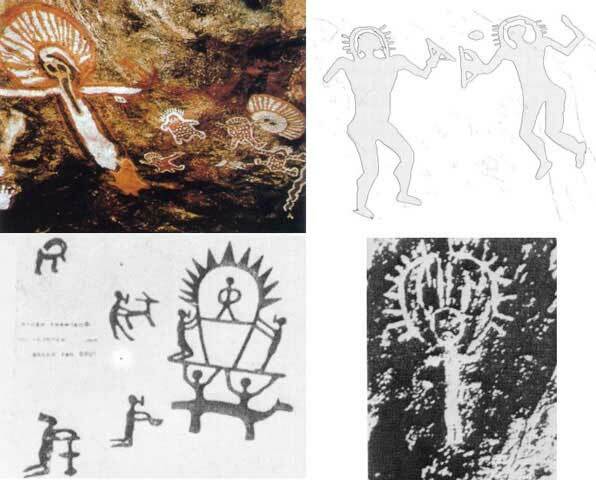 Shown here are several ancient enigmas which may or may not suggest that the ancients could fly. 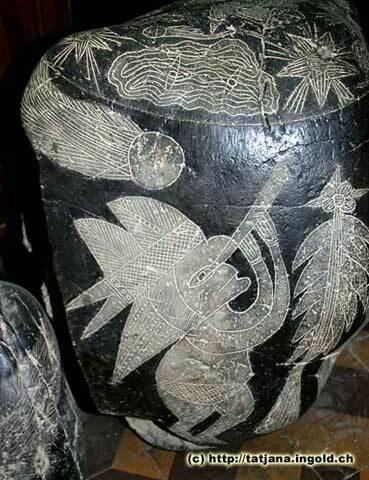 What do these carvings and statues represent? Figure 58. 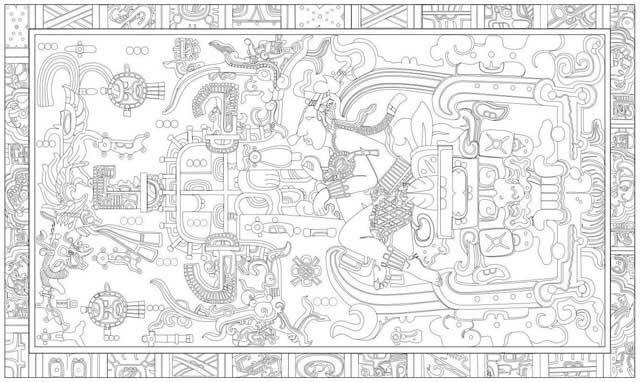 The Mayan Lord Pacal in a flying contraption? Figure 60. Helicopter, ‘space ship’ and side view of an aircraft at Abydos, Egypt? These ‘insects’ of solid gold discovered in Columbia seem to resemble modern jets rather than insects which have their wings on top of their backs. Three German model enthusiasts, Eenboom, Belting and Lübbers, constructed at first a propeller-driven and then a jet-engine driven scale model of the ‘insect’ on the right. 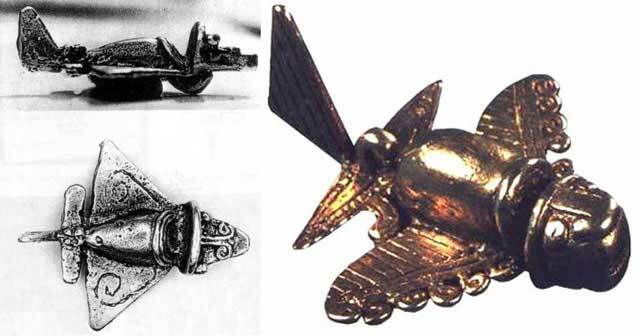 Both models flew perfectly, demonstrating that these artifacts may very well represent ancient aircraft of some kind, as unthinkable as that may be. Figure 63. ‘Goldflyer’ scale models. 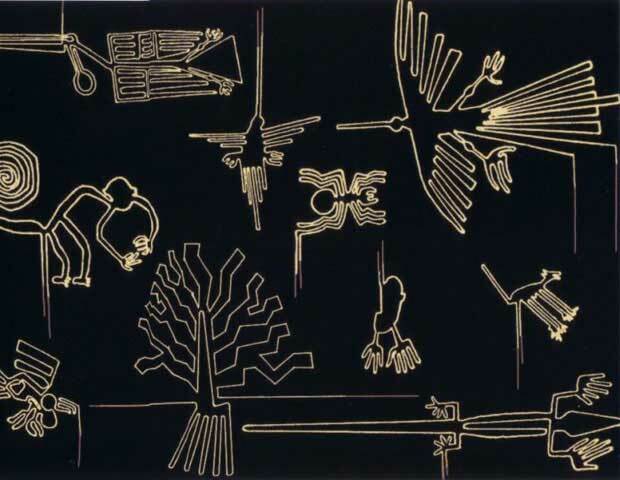 The Palpa Lines appear to be less known than the famous Nazca Lines (Section 13 below), but are in many ways significantly more intriguing. 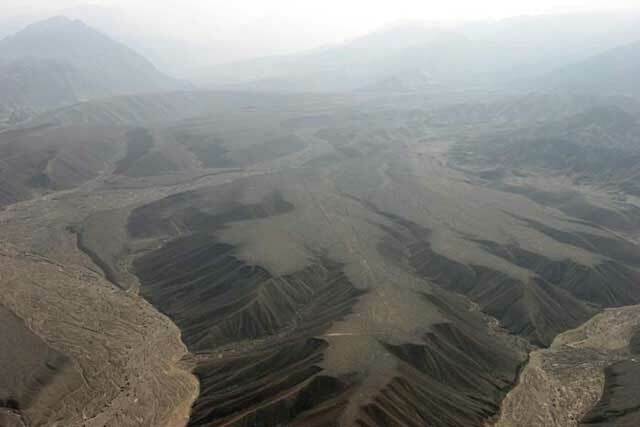 There are numerous mountains with flattened tops, perfectly straight lines running across mountains and valleys as well as drawings and images similar to those found at Nazca. 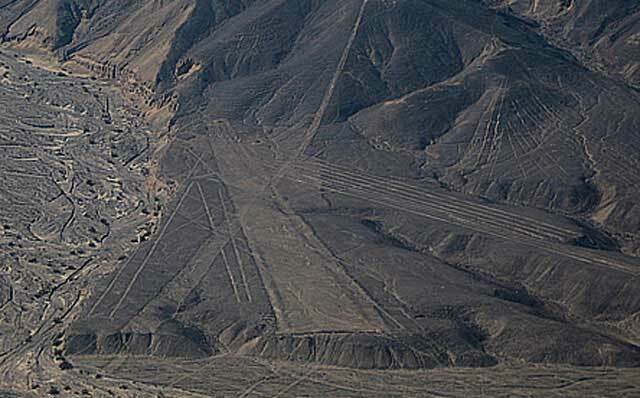 On of the greatest collections of photographs of both the Nazca and Palpa sites can be found here – the images below have all been duplicated from this website. Figure 64. Were it not for the uneven surfaces, these ‘strips’ may very well have been landing strips. They appear to have been created by a giant with a spray gun directly from above. 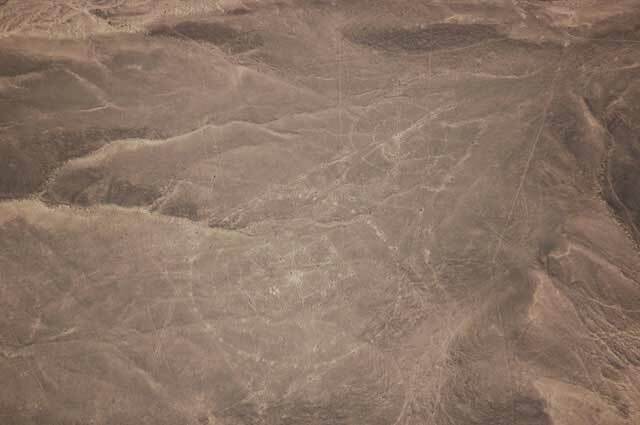 Could these lines have been created by some kind of airborne machine? Figure 65. Flattened mountain tops - landing strips (left & centre)? Note the numerous straight lines crossing mountain ranges and valleys (right). How were these created, and for what purpose? Figure 67. 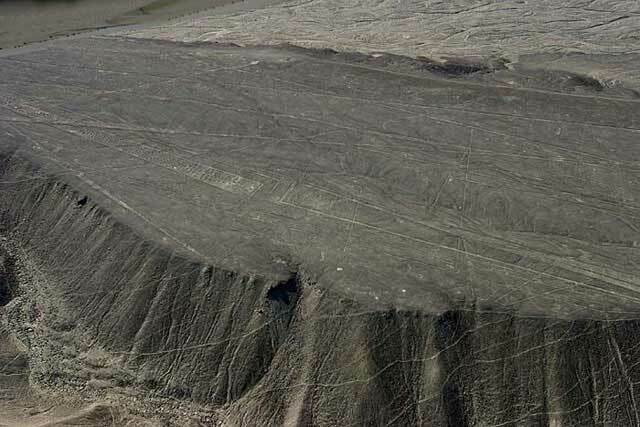 Flattened mountain top – how many tons of rock would have had to be removed, for what purpose? Note the ‘band of holes’ and the part at the top that has not been levelled (lighter with woolly appearance). Figure 68. 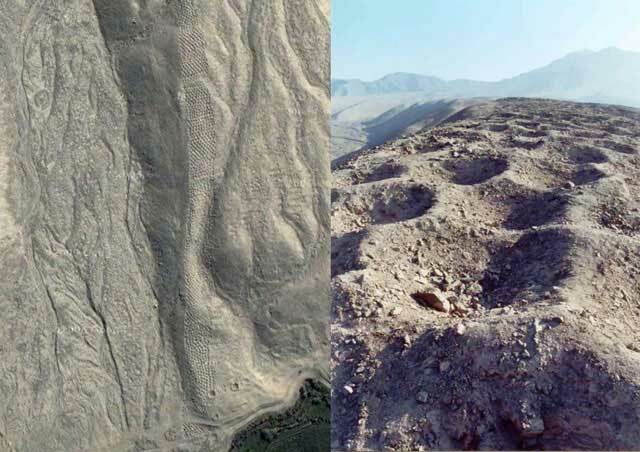 Band of holes (holes 1m diameter, 1m deep, 1 km long) at Pisco, Peru. For what purpose were these holes created? Graves they were not, as no bones have been found inside. Figure 69. Skimmed mountain tops – did they do this just for fun? These flat surfaces certainly appear to be man-made. The “Star” geoglyph above is simply mind-boggling. It was constructed with precision over a mountainous terrain, seemingly from high above! What could it have been used for? To impress the gods? 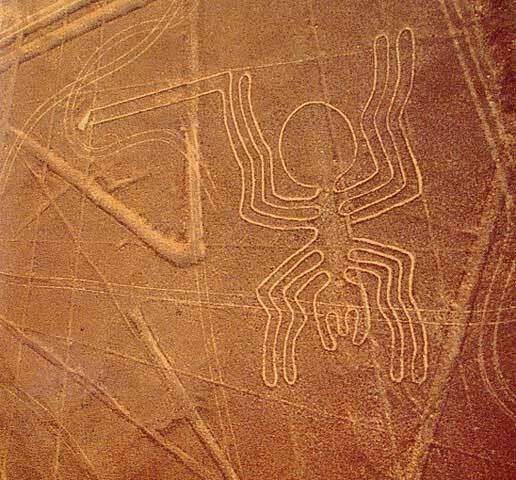 The Nazca lines remain one of the greatest enigmas of ancient times. 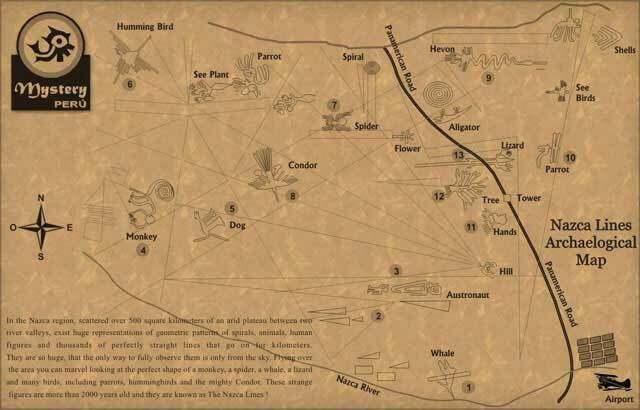 The map below shows the general lay-out of the famous lines, the largest of the figures over 200m long. The purpose of these lines is hotly debated, the general consensus being that they were drawn for some religious purpose, to placate or bemuse the gods. 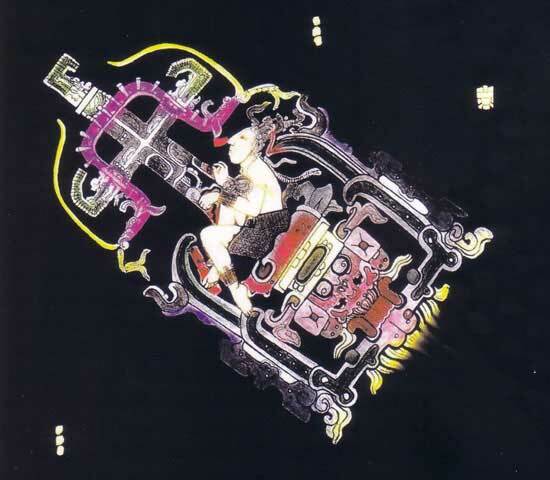 If this was not the reason, it would otherwise imply that the images were drawn to be visible from the sky, and therefore that human beings could fly in ancient times. 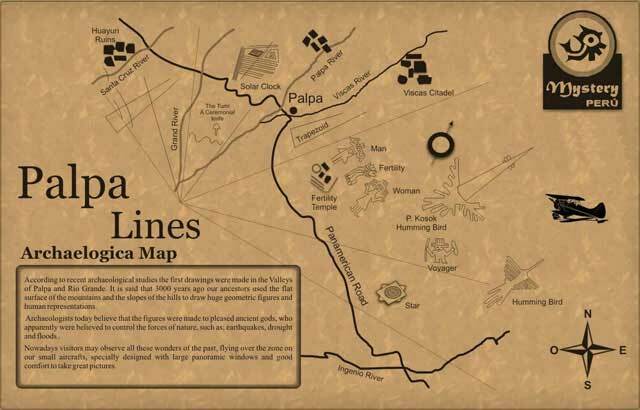 The lines are generally believed to have been created during the last centuries before the Christian era, but it could be much older, as generation after generation my have preserved the lines for posterity. The collection below displays some important aspects of all these images, namely that they were drawn continuously, starting at one point and ending at another, but more curiously, that they all required a “touch-down” and a “take-off”, in a manner of speaking. If these lines had been created by men manually clearing the lines in specific shapes, there would have been no need for these ‘approach’ lines, or in fact for any of the drawings to be continuous. 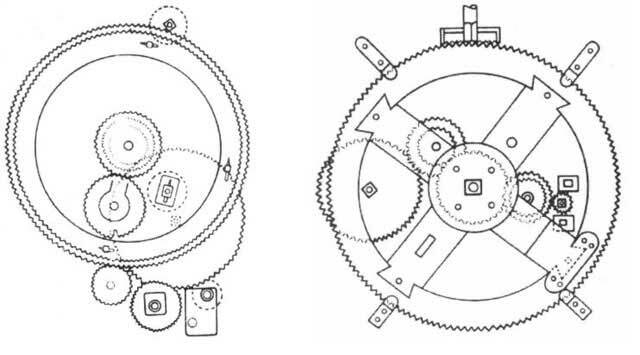 Do these characteristics point to the use of some kind of machinery (airborne?) to create the drawings? Figure 77. 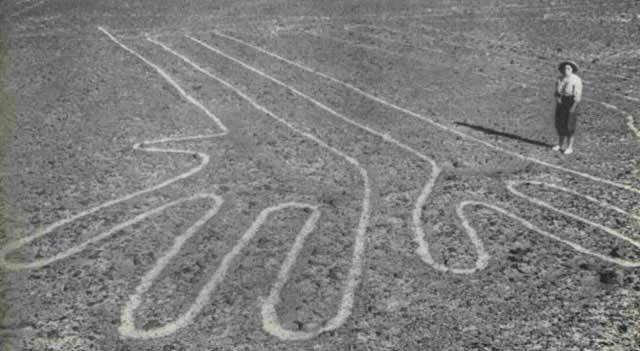 Maria Reiche, preserver of the Nazca Lines, at the Dog’s Foot. 14. 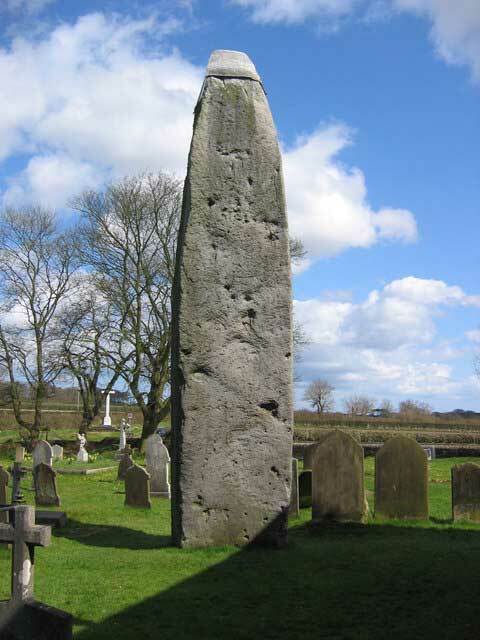 Megaliths – markers of the Gods? 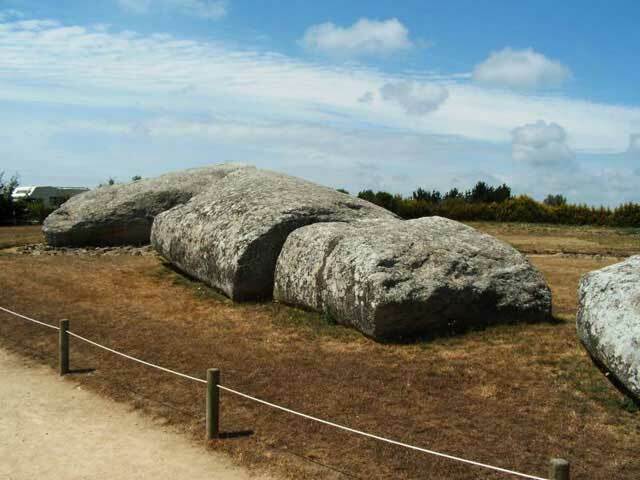 Megaliths in the context of this chapter refer to standing stones of enormous size found all over the world, erected for purposes unknown to us. Opinion appears to be split between two theories, one being that they were erected for religious purposes only, and the other that they were erected for astronomical purposes or some other scientific application. 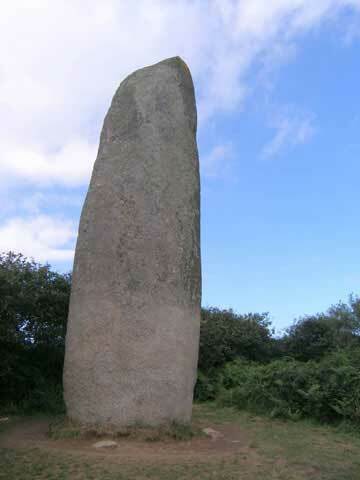 I have included some photographs of monoliths below, for the reader to consider. 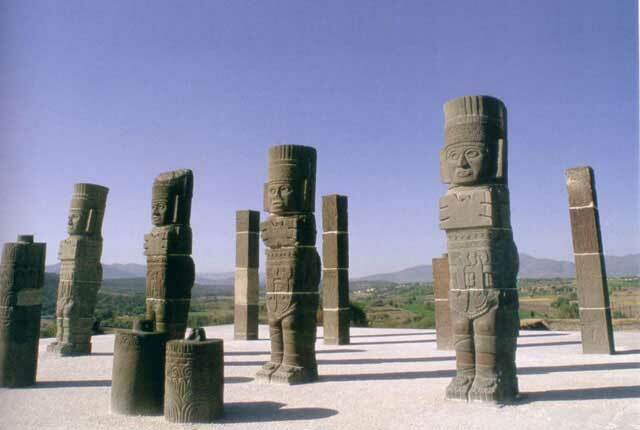 Also included are some famous megalithic statues, many of which must have been extremely difficult for the ancients to manufacture. Figure 78. Stonehenge - one of the most famous. Some blocks in the Stonehenge weigh an estimated 50 tons. 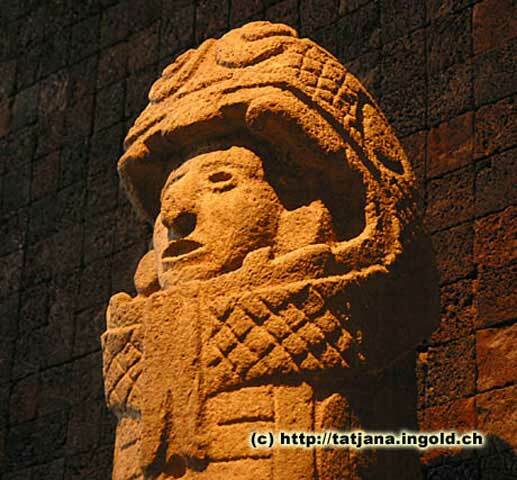 It would not have been an easy task to construct in ancient times, why go to all that trouble? The reference to ‘fires’ may link this culture to Tierra del Fuego and the destruction of Terra Australis Incognita as argued in Section 1.1.3 above. 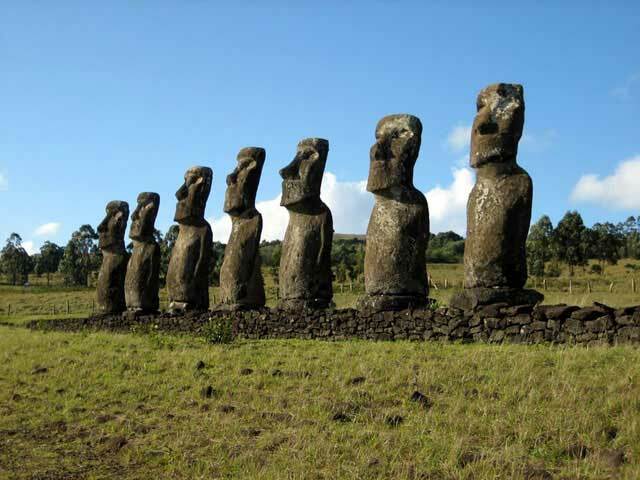 Some of these statues are 10m tall and have been estimated to weigh 82 tons. 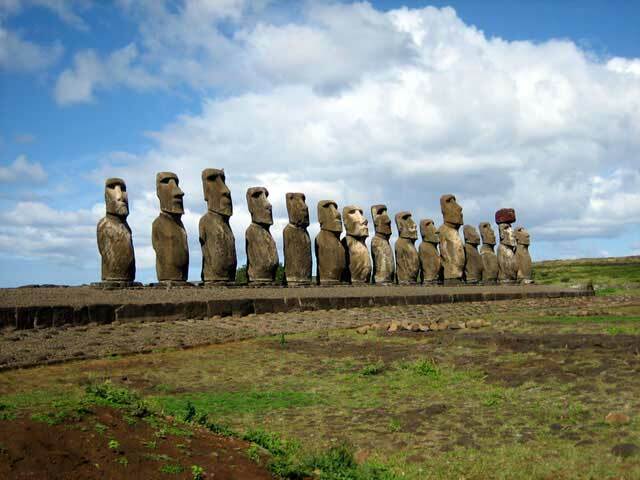 The largest statue ever made, El Gigante, still lies unfinished at Rano Raraku. It is 21.6 m (71.9 ft) long and has been estimated to weigh up to 270 tons. How did they plan to raise this? The excavation shown in the photograph on the right revealed a thick layer of compacted volcanic ash. When these ash deposits occurred is not known, but if it could be determined, it should reveal the youngest age of these monuments. 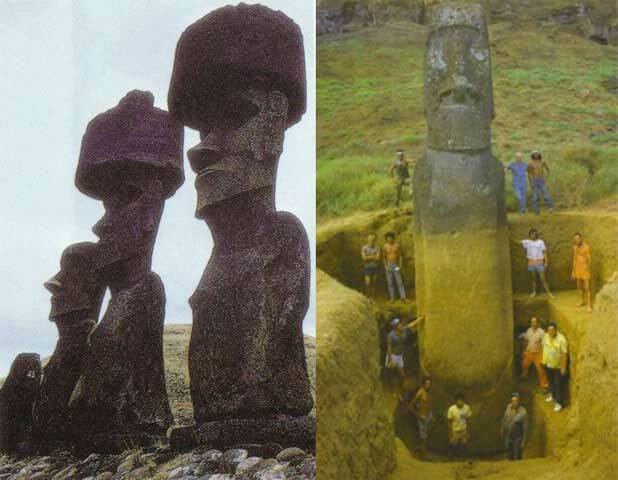 Does the similarity between the Easter Island and Toltec statues not suggest that the natives who lived here were exposed to the same influences (of an older and more advance civilization)? 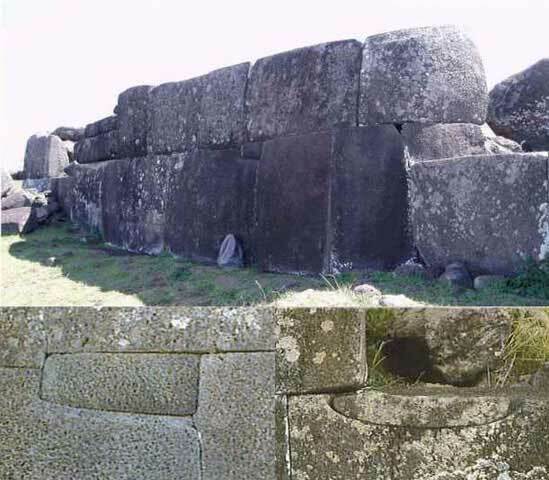 Likewise for the masonry found on Easter Island as compared to that found at Lake Titicaca? Several huge monoliths are to be found in New Zealand. Are these natural rock formations, or could they be man-made (erected)? If so, for what purpose? Solstice markers? 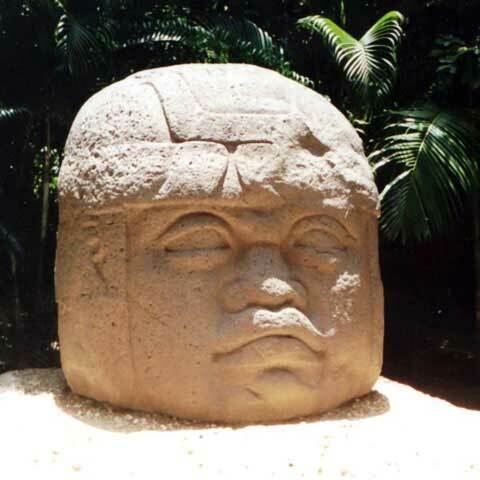 Though strictly speaking not ‘standing stones’, the Olmec heads are remarkable not only for their size (3m high, weighing up to 50 tons), but also for their African-like facial features. Could these rulers indeed have been Africans? Figure 86. Olmec head No 1. 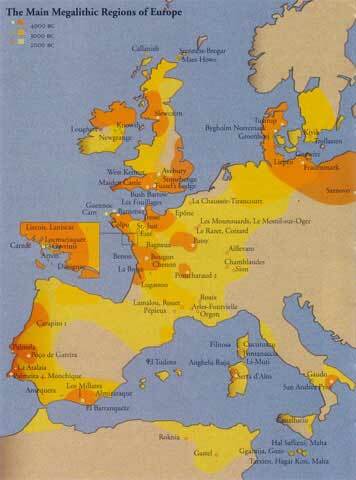 Europe has numerous megalithic sites, as indicated in the map shown below. What were these used for? 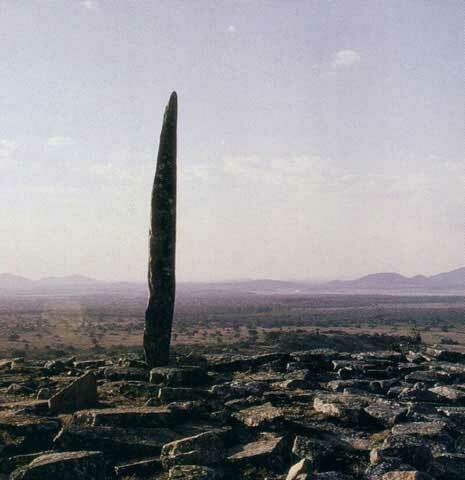 Much has been speculated about the origins of the Great Zimbabwe Ruins (Figure 93). Whoever had built them seems to have been influenced by the same culture that erected standing stones elsewhere in the world (Figure 94). 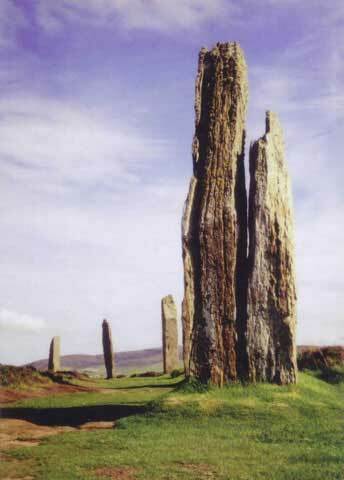 Do these standing stones not suggest the presence of an older, worldwide civilization? The vitrified forts of Scotland and certain parts of Europe pose somewhat of an enigma, although not necessarily suggesting an ancient age. Vitrified fort is the name given to certain crude stone enclosures whose walls have been subjected in a greater or less degree to the action of fire. They are generally situated on hills offering strong defensive positions. Their form seems to have been determined by the contour of the flat summits which they enclose. The walls vary in size, a few being upwards of 12 feet high, and are so broad that they present the appearance of embankments. Weak parts of the defence are strengthened by double or triple walls, and occasionally vast lines of ramparts, composed of large blocks of unhewn and unvitrified stones, envelop the vitrified centre at some distance from it. No lime or cement has been found in any of these structures, all of them presenting the peculiarity of being more or less consolidated by the fusion of the rocks of which they are built. This fusion, which has been caused by the application of intense heat, is not equally complete in the various forts, or even in the walls of the same fort. In some cases the stones are only partially melted and calcined; in others their adjoining edges are fused so that they are firmly cemented together; in many instances pieces of rock are enveloped in a glassy enamel-like coating which binds them into a uniform whole; and at times, though rarely, the entire length of the wall presents one solid mass of vitreous substance. Figure 95. Vitrified wall at Sainte Suzanne, France. It is not clear why the walls were subjected to vitrification. Some antiquarians have argued that it was done to strengthen the wall, but the heating actually weakens the structure. 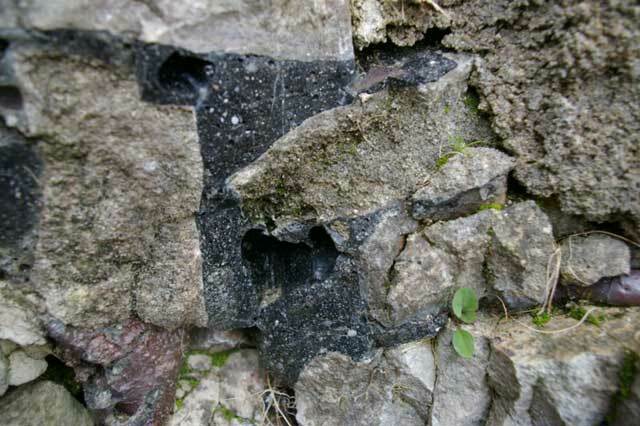 Battle damage is also unlikely to be the cause, as the walls must have been subjected to carefully maintained fires to ensure they were hot enough for vitrification to take place. Currently, the most popular suggestion is that the process was a symbolic demonstration of power, spectacularly removing the seats of a warrior aristocracy. The dating of the construction of these forts varies from 700 BCE to 900 AD. It is not only the possible reason for the vitrification of these walls that is puzzling, but also how the builders managed to apply such intense heat over such large surface areas. A good overview of the process can be found here. This site and all articles within reflect the opinions of Riaan Booysen. All rights reserved. Copyright ©2018 RiaanBooysen.com. Web development by Web Guru.